I have a bit of a tolerate/hate relationship with Gwyneth Paltrow. A relationship primarily sustained on my fumes of jealousy, quite frankly. And yet, I can’t stop myself from dropping by her lifestyle blog, Goop, once in a while. Mostly because it’s a goldmine of pretentiousness, but it can also be (unintentionally?) funny. 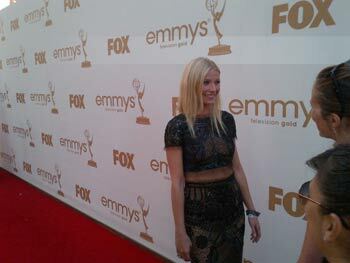 This week, she features an “Emmys Scrapbook” taking us through her day at the Emmys. It starts, pretentiously enough, in Paris. The jealousy cauldron has already begun to bubble and I’m only at the 9:30 spot. "What's that? Yes, I have heard of the Poe Log, I read it all the time." So, in the spirit of Gwynnie, here’s a comparison of our “Emmys Scrapbook” (*note: the Emmys were held on Sunday, September 18, by point of reference). My journey to the Emmys starts Saturday morning in Paris where I stayed at the new and very gorgeous hotel Shangri-La Hotel, after a friend’s birthday dinner. Have a play at home with the kids before getting everyone ready to go to the airport. Arrive at LAX and head straight for my hotel. Lately, when I’m in Los Angeles for work, I’ve been staying at the beautiful and very centrally located Montage. Amazing service! Amazing! … I go right to bed as tomorrow’s an early wake-up. Drag myself to the Run Geek Run 8k. Have a play date with a janky, broken iron (it keeps switching itself off!) and two week’s worth of ironing. Collapse in front of television with Chipotle salad bowl courtesy of my personal chef XFE. Amazing service! Amazing! I hit the Montage’s gym for a workout. I stop by Sonya Dakar’s skin clinic for one of her amazing facials so I’m ready for the red carpet. Prep for the Emmys begins with David Babaii on hair and Kate Lee on makeup. David and I decide to go for super straight hair. I change into my dress and I literally get sewn into it, while Kate finishes up. 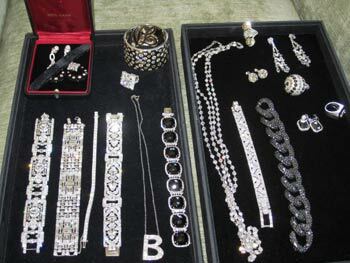 Decisions, decisions … Which of these Neil Lane baubles should I borrow? David Babaii helps me get into my shoes. No task is too small for David! It’s a minute to show time, and I find my seat in the second row (right behind the cast of 30 Rock!) The seat filler before me was sweaty … so my chair was wet. Gross! The 63rd Primetime Emmy Awards begin, hosted by Jane Lynch from Glee! I live for Tina Fey and I love Kenneth from 30 Rock! Wait … why does my arm look like that and since when do I have 9 chins? I present the award for “Outstanding Comedy Series.” The teleprompter clearly doesn’t work, so I ad lib. The show’s over, and we head to an incredibly delicious dinner at Scarpetta. We did a big pasta tasting with some nice Pinot Nero. Just the thing. I hit the snooze for an arm workout and try to convince XFE that we should sleep in just this once. He disagrees and goes to work. I pout and search for some trashy reality TV marathon, to no avail. I stop by the Poe skin salon/bathroom for one of my amazing showers so I’m ready for the non-stop chore list. Then I decide there’s no point since I’m just going to get sweaty and dirty, and just brush my teeth. Prep for the chores begins with Poe on laundry and Petunia on supervising. Petunia and I decide to go for super loads of laundry. I change into bathroom cleaning attire (rubber gloves) and I literally go clean three toilets, while Petunia supervises from various doorways. Decisions, decisions … Which of these toilet brushes should I use? Petunia helps me with….nothing. No task is too small for Petunia! It’s a minute to yard work, and I find my place on the back patio (right next to where the Poop Burglar visited us!) The seats of our patio chairs are filled with trillions of wet leaves……that I have to scoop up and remove with my hands. Gross! I live for clean kitchens and I love vacuum cleaners from Dyson! Wait … I don’t “like” either of those things and I don’t have a Dyson. Why do I lie like that? I present the award for “Outstanding Temporary Cleaning Lady While Maid Is Out Recovering from Surgery.” The teleprompter clearly doesn’t work, so I ad lib. XFE is clearly not amused as I am blocking the view to some football game while giving my acceptance speech. Into a toilet brush, naturally.